Today’s book is Daphne du Maurier’s Rebecca and it’s one that I adore! This is one of my all time favourite opening lines! Even though I wasn’t really impressed by Rebecca overall, I remember being intrigued from the moment I opened it. 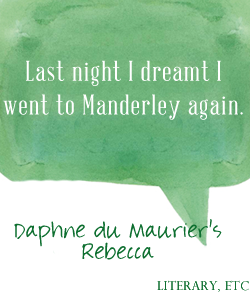 It’s so eerie, and I immediately wanted to know why she was dreaming of Manderley, and what Manderley was.